Hello! 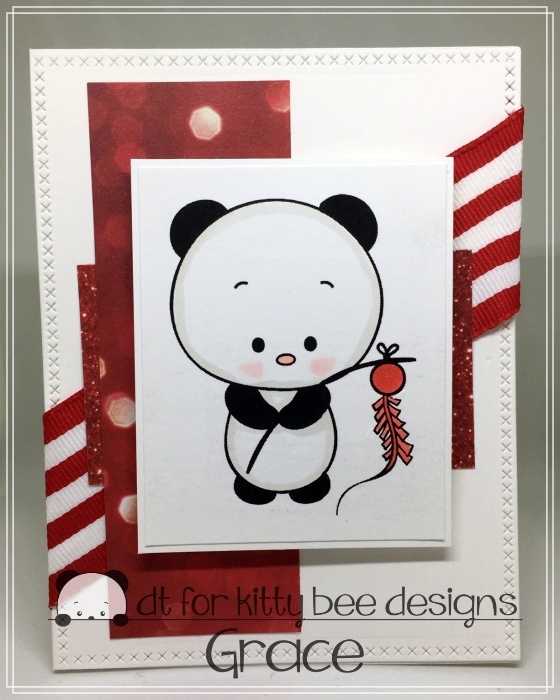 It’s Karla back today to share a cute note card with you using the Post It Note Panda clear stamp from Kitty Bee Designs. 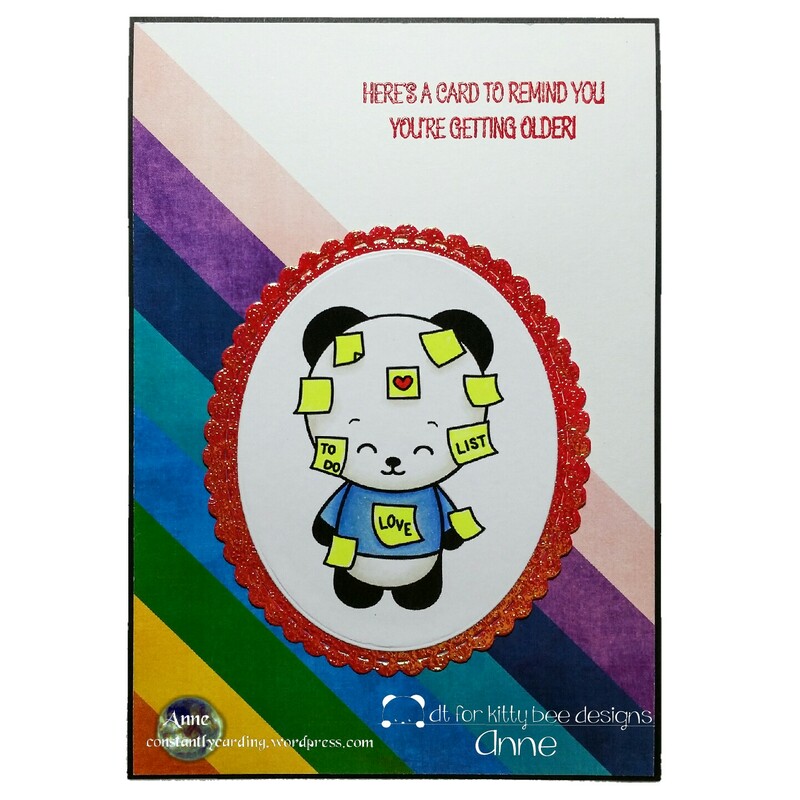 This cute little guys is ready to say thanks, hello or just send a note to someone special! Be sure to check out all the details, closeups and inside on my blog here. Have an awesome week friends!! Hello! 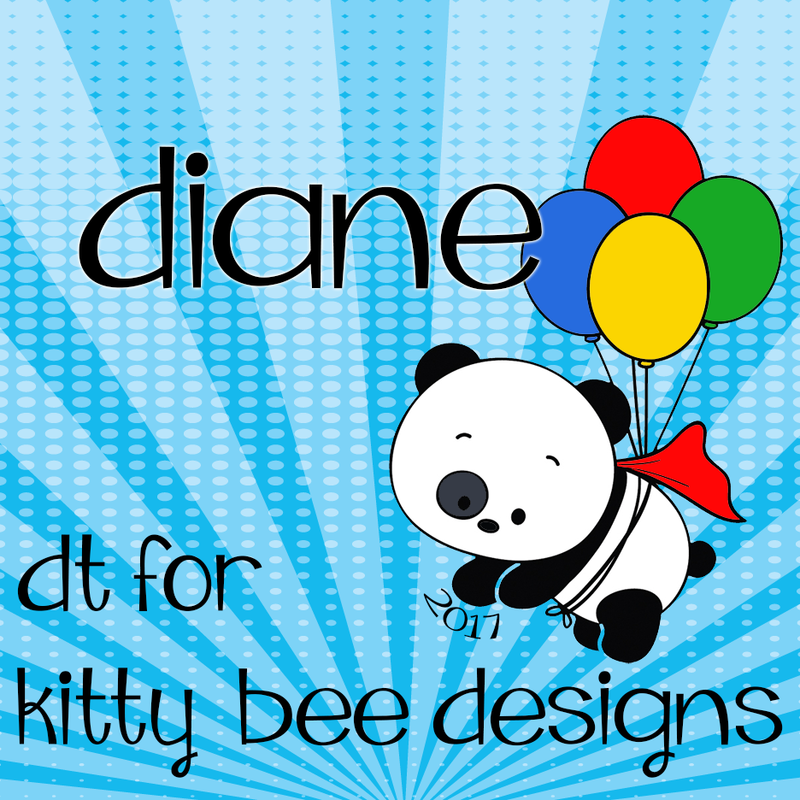 Today I'm sharing a quick card I've made using Kitty Bee Designs' Post It Notes Panda. I initially thought it would be a great stamp to use for a belated greeting but then I remembered I had a sentiment stamp that would work just as well with this image. Today I would like to share with you my February Spotlight Kitty Bee Design Team Inspiration. 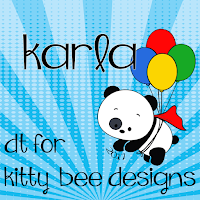 I am using the "Love Bug Girl Panda." I didn't find this particular digi in the Esty shop but I did find the boy one HERE. If you really want the girl, please email the shop owner and she will upload the girl for you to purchase. I hope you like the card I made. Please see my blog, PrettyFun.org for additional details on the products I used for making this card. 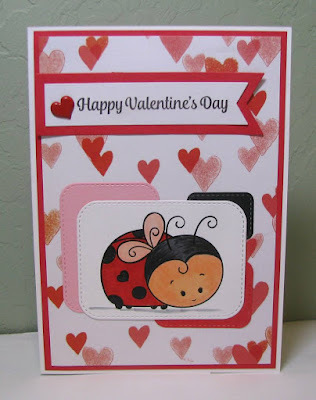 and more easy to color digital stamps. 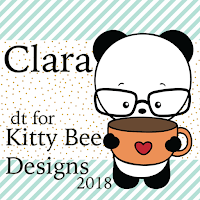 Please visit my blog to see more. I just adore the Kitty Bee ladybugs-aren't they just precious? They are just wonderful images for any occasion! If you can't find it in the Kitty Bee store, just ask for the image-customer service is the best! Today is my spotlight day over at Kitty Bee Design Team, and I'm showcasing Coffee-Stationary Panda. But my cutie is having tea instead of coffee this morning, LOL! 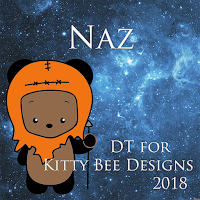 You can get this digital image at KBD etsy store here along with all their rest of their cuties! Hello everyone, I hope you're having a fantastic start to fall! Are your kiddos enjoying their first weeks of school? Mine are! 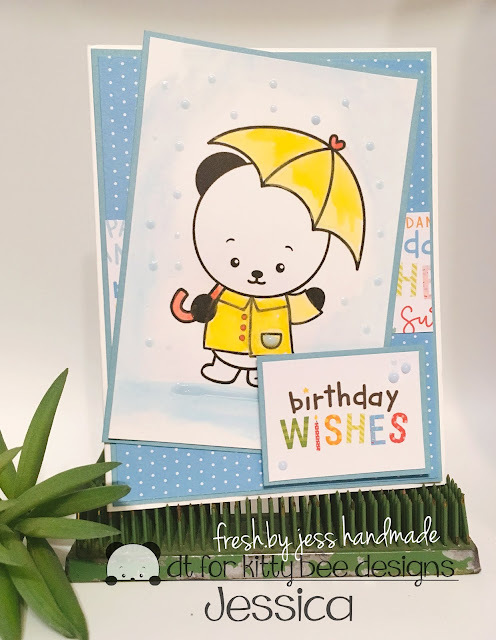 Jennifer here with you today to share my latest spotlight card! Check out this adorable Baby Panda. Squee! He's the sweetest, perfect for so many reasons. I need them all...pandas forever! Thanks for stopping by today! If you enjoy my work here on the Kitty Bee Designs blog, feel free to visit me over at Glitter in my Hair. Have a fabulous day and stamp happy! It's Jess here today with my February Spotlight! My card today features the Kitty Bee Designs stamp called "Rainy Day! 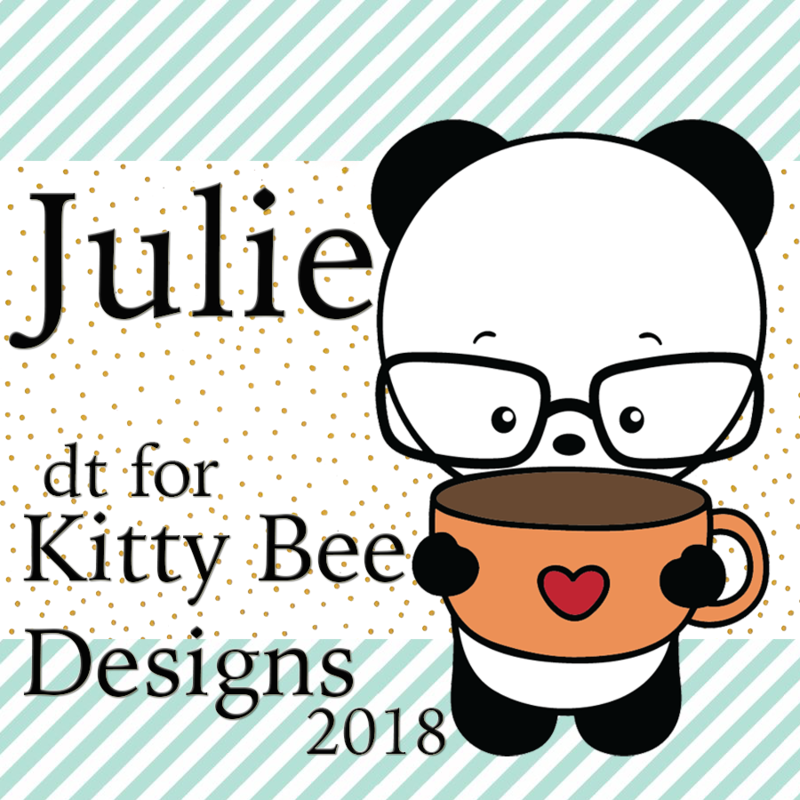 Welcome to my February Spotlight post. So has it Valentine this month had to do this cutie. I have coloured him with pens in greys,blues & added the sparkle pen in red for the heart. Cut out with a 2mm boarder. 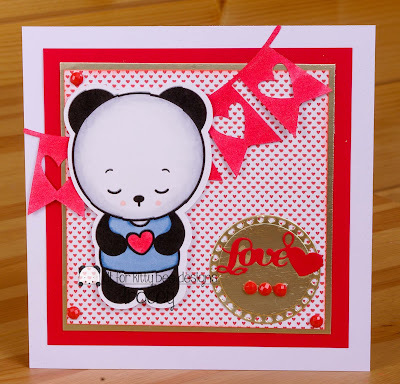 His added to the tiny heart pattern paper,gold & red card. My extras are the red glitter banner,gold heart circle,red die cut sentiment & the red gems. A sweet card for anyone!! Hi! Julie here, sharing with you today from Muddy Paws & Inky Fingers. I'm sharing an inky creation with you today using the adorable digi, Kawaii Ms. Owl, found in the Kitty Bee Designs Etsy Shop. I colored this sleepy time Owl with Copic markers, then fussy cut her. I inked the background with distress oxide inks. I hope you like this Kawaii Mr. Owl. Check out all the delightful digis and acrylic stamps in the Kitty Bee Designs Etsy Store. Join us on Fridays for the Aloha Friday Challenges. Happy Tuesday! Marcia here from The Frolicking Fairy with my first Kitty Bee Designs Spotlight post of the the year. 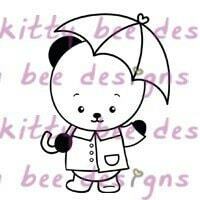 I'm sharing a Valentine using Post It Notes Panda. 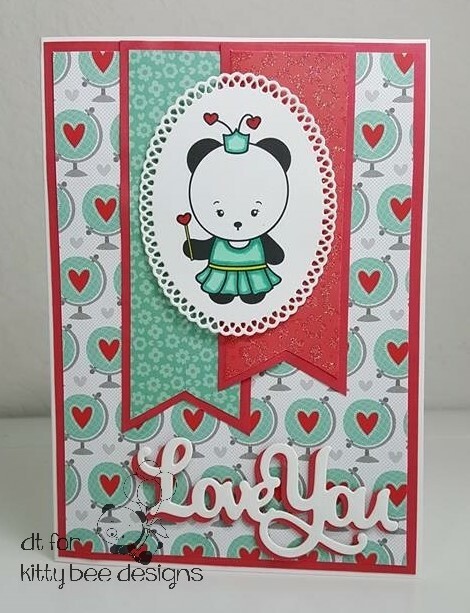 I merely created several layers with papers in my stash, spotlighting the "I (heart) you" sentiment in the patterned paper on the upper right of the card front. 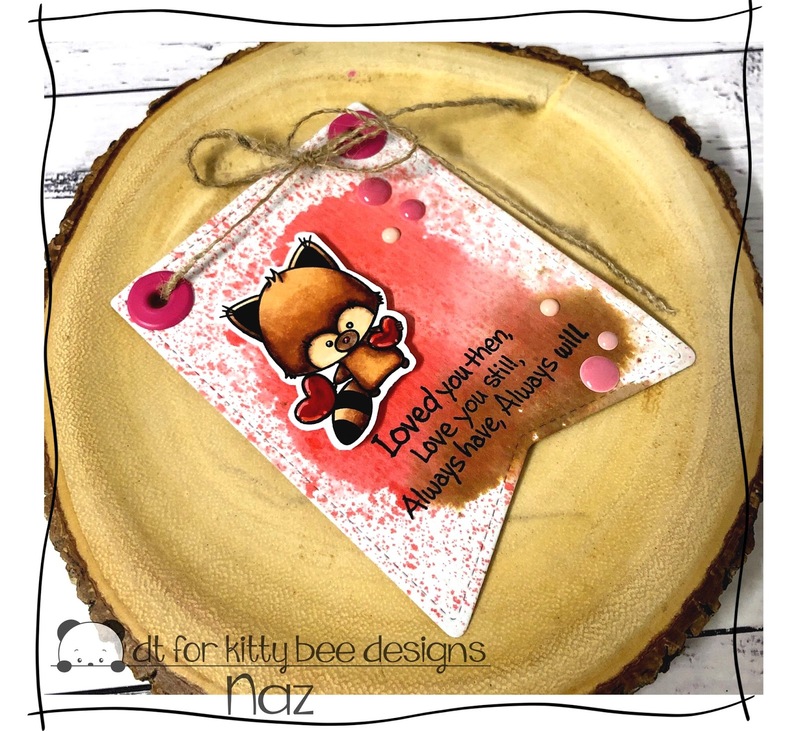 There is still plenty of time to get some Valentines made this year! 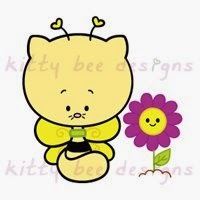 Happy February to all of my Kitty Bee Friends. 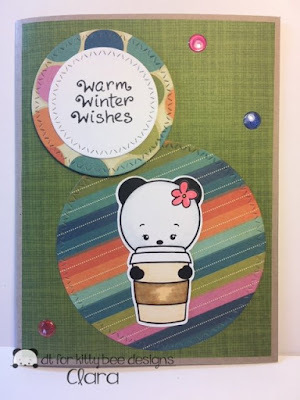 This month I've got a fun card to show using an adorable digi image called Coffee Panda Girl. It's really cold in the North East right now and this little Panda knows what helps keep you warm! You can find this image in the Kitty Bee Designs Etsy shop, here! If you'd like the particulars on this card, you can visit me on my blog, here! I'll be back on the first Sunday of March with a new spotlight for you!